Description: Dill is a member of the Umbelliferae (parsley) family. It grows to about three feet high with inflorescence of yellow flowers, appearing in the summer. 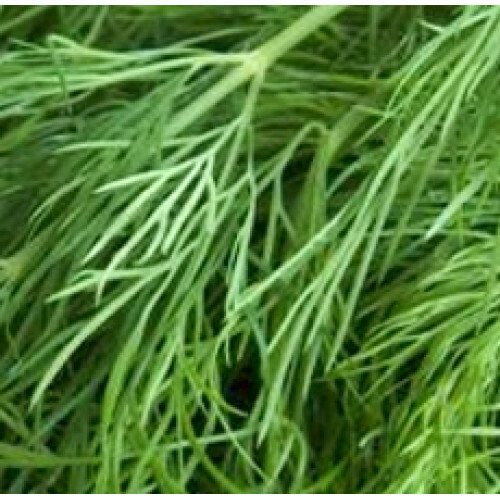 Aromatic Scent: Dill Seed Essential Oil has a fresh, herbaceous scent that is gentle, warm and spicy. Common Uses: Dill Seed essential oil is mostly used in Aromatherapy because of its stimulating, revitalizing, restoring, purifying, and balancing properties. History: The name is derived from the Norse word Dilla meaning to lull. The Anglo Saxons used dill medicinally for many health problems, but it was commonly used as a carminative; the Emperor Charlemagne kept it on his tables as a digestive aid for guests. Modern-day dill pickles are considered an appetite-suppressing food.